Bonnie Parker, a bored waitress, meets Clyde Barrow while he is committing a crime. Instead of reporting him, she is seduced by his promises of a life of luxury funded by a crime spree. Their first few robberies are small-time affairs but when the gang expands to include Clyde’s brother, his wife and another man, they graduate to holding up banks. Initially, the outlaws embrace their fame, but they soon find that life on the run is harsh and the fear of discovery makes it difficult to enjoy their wealth. Barely surviving a bloody battle with state police, the lovers attempt to give up the outlaw life but law enforcement officials pressure their friends and family to reveal their location. At one point in the movie, the well-dressed outlaws stroll into a bank and confidently announce “This is the Barrow gang. We rob banks.” It would have been more accurate to say “we rob gas stations.” Admittedly, the screenwriters clearly did their research. Several scenes in the movie recreate actual photos of the outlaws, such as a famous picture of Bonnie posing with a gun while resting her foot on the front bumper of their car and the scene where Buck and Blanche are captured in the field near the end of the movie. The screen Bonnie even reads out loud her poem Suicide Sal. While many images from Bonnie and Clyde’s lives are faithfully presented, much of the movie is made up. The real Bonnie and Clyde met through a friend but their relationship got off to a rocky start when he was arrested. However, she stayed true and helped him win parole. Instead of going straight, Clyde’s hatred of work drove him to commit a robbery with Bonnie and a friend named Ralph Fults that landed both Bonnie and Fults in jail. After teaming up with Raymond Hamilton, the two men started a drunken gunfight with a sheriff and his deputy that ended with the outlaws panicking and firing onto a crowded dance floor. From that point on, Clyde swore that he would never surrender, since he knew that he would be executed for killing the deputy. Although Clyde was an incompetent with a twitchy trigger finger, he had become a skilled driver with an encyclopedic knowledge of the roads in Texas and nearby states, as well as the stamina needed to drive hundreds of miles in a single day. He had acquired such a fondness for the speed and reliability of the Ford V-8 that he wrote a letter to Henry Ford praising his cars. Despite experiencing the harsh reality of prison, Bonnie went back to Clyde after a couple of months in jail. Bonnie and Clyde were able to live a comfortable life on the proceeds of holding up gas stations and grocery stores. The couple had become famous because of their numerous escapes from traps set by the police, often leaving a law enforcememt officer lying cold and lifeless on the ground. The recruitment of Clyde’s brother Buck and his wife Blanche is basically correct, but C. W. Moss is a composite character based on sixteen-year-old W. D. Jones and Henry Methvin. Unlike Moss, Jones ditched them soon after a police raid resulted in the capture of Buck and Blanche. When he was arrested by the police, he revealed everything he knew but the couple escaped yet another ambush. Bonnie and Clyde then helped Hamilton and several other prisoners, including Methvin, escape from jail. Infuriated by the death of a prison guard, the warden persuaded former Texan Ranger Frank Hamer to lead the hunt for the outlaws. The screen gang captures Frank Hamer when he was in Missouri chasing after the reward, and Hamer is played cold and hard by Denver Pyle. 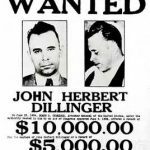 This is a deliberate attempt to vilify Hamer, since he actually gave up a much more lucrative position to lead the hunt for Bonnie and Clyde, and he had never met them until he started the hunt. Hamer’s posse finally caught the couple in a ambush by forcing Methvin’s father to pretend to have flat tire and tying him up to prevent him from warning them. His cooperation was ensured by promising leniency for his son. Clyde and Hamilton had argued over whether to remain small-time (Clyde) or rob banks (Hamilton), so Hamilton left the gang again after a few weeks. When the police found Hamilton on April 25, he simply said “I’m Raymond Hamilton and I don’t intend to give you any trouble. I’m just fresh out of ammunition, money, whiskey and women. Let’s go to jail.” Unfortunately, neither Hamilton nor his comments appear in the movie. There is no denying that it was dangerous for the outlaws to visit their kin but the families paid a price as well, since roughly twenty of Bonnie and Clyde’s relatives were forced to spend time in jail for harbouring known criminals. 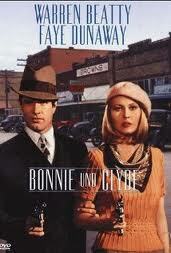 Even though the writers knew what Bonnie and Clyde were, they still chose to glorify them. Any part of the real history that is detrimental to the characters’ image is removed, including the serious burns that Bonnie received in a car accident, and the grocery store owners and law officers that ended up six-feet-underground because of Clyde’s jittery trigger finger. One scene in particular highlights the difference between Beatty’s fantasy and the real Barrow. While robbing a small grocery store, the owner attacks Clyde with a meat cleaver, but Clyde manages to subdue him, although the real Clyde panicked and shot a grocery store owner who did just that. Beatty’s Clyde is mystified that the grocer wanted to kill him for stealing a few dollars, but seems to forget that it was the Depression, when everyone was poor and struggling to survive. The film continues to try to portray them as robbing only from the rich by showing that farmers were allowed to keep their money during bank robberies, but neglects to consider that the farmers’ savings were in the bank. The final ambush of the outlaws was accurate, although the outlaws were armed and the posse fired without warning because too many law enforcement officials had been killed trying to arrest Bonnie and Clyde. By that time, the outlaws were viewed as rabid dogs that needed to be hunted down and killed. Credit and blame belong equally to Warren Beatty. It was his movie and he managed every aspect, including the selection of the actors, almost all of whom were talented unknowns. This was the first time that Beatty produced a movie and he brought in his friend Robert Towne to tailor the script to fit him. Towne eventually became one of the top script doctors in Hollywood, which explains the excellent dialogue. Francois Truffaut originally had the script for Bonnie and Clyde, which he let Beatty’s then-girlfriend Leslie Caron look at. Beatty fell in love with the script and bought the rights without informing Truffaut. The screenwriters, Robert Benton and David Newman, had intentionally written a script to epater le burgeois, which basically means shake up the squares. Ah, those crazy, rebellious kids. Beatty clearly did not share the screenwriters’ desire to break taboos, since the homosexual affair between Clyde and Moss was deleted from the script. Naturally, Beatty’s Clyde is a crack shot, who shoots guns out of people’s hands and always remains calm, shooting the hat off a bank guard’s head as a warning when he makes a move for his gun. However, he is not your stereotypical macho tough guy, he is sensitive because he suffers from erectile dysfunction. There is a Hollywood legend that Beatty’s track record was so poor that he had to kiss Jack Warner’s feet to get a budget of two million dollars (considered modest at the time) for the film. Warner had so little faith in the movie that he promised Beatty 40% of the gross, so he must have felt slightly foolish when the film became a massive hit. There is no denying that it is a gorgeous film. Penn was given great sets and he made the most of them. The movie was unlike anything that had preceded it, and its success helped usher in the New Hollywood era. Part of the reason for the movie’s success was that instead of the usual Hollywood faces the supporting actors were from New York. Also, the love scenes were quite graphic for the 1960s. It is a beautiful film with a horrible, repulsive message that is an inexcusable glorification of trigger-happy outlaws. Fantastic film. historically BS, but a wonderful film. It is a beautiful film, no doubt, just glorifies murderers. Most films of its kind do.